A proposed ban in Denton, Texas, could cost the city more than $251 million in economic activity. While considering a ban on hydraulic fracturing this summer, the city council in Denton, Texas, heard some compelling testimony from concerned residents. As the CEO of an energy company based in Dallas, just south of Denton, and having witnessed the eight-hour hearing there, I can see why some Americans in cities like Denton are looking to prohibit fracking. Too many citizens in oil- and gas-rich regions around the country have suffered at the hands of a few irresponsible energy firms. But the misdeeds of a handful of companies don't warrant sweeping fracking bans—especially when such prohibitions come with extraordinary economic and environmental costs. Instead of rejecting promising new energy-extraction techniques, citizens should work with responsible energy companies to preserve the benefits of fracking, while stamping out current abuses. 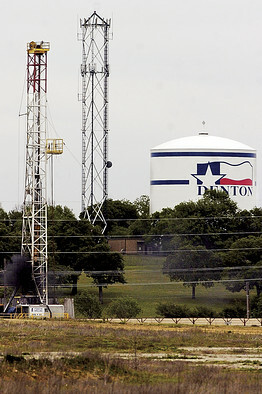 The continuing debate in Denton is representative of fracking controversies around the country. In Denton, a large number of locals are legitimately concerned about the proximity of fracking operations to their homes. Energy extraction is loud. Fracking rigs are ugly. Truck traffic can seem endless when an operation gets under way. Studies haven't supported claims of water contamination, but the perception exists. A new city ordinance in Denton requiring a 1,200-foot setback between drilling sites and residences was supposed to put such worries to rest. The problem is, the new rule doesn't apply to many existing wells already located near homes—a loophole that has been exploited by several companies. Similar abuses have been well publicized in recent years. Consider the case of Gary Gless, who bought a modernist house in Los Angeles overlooking a golf course in 2002, only to have his view obstructed by drilling wells soon after. Or Susan Fowler of Cleveland, who had to sell her home at half its appraised value last year after a well sprang up next to her backyard. Like highways and power lines, fracking wells have an impact on a home's value—for the worse. In instances like these, residents are understandably outraged. But such horror stories are hardly the norm. And the misbehavior of a few irresponsible companies shouldn't be grounds for across-the-board fracking bans. First off, fracking restrictions have disastrous effects on local economies. According to an estimate from the Perryman Group, an economic and financial analysis firm, Denton's proposed ban would cost the city more than $251 million in economic activity and prevent the creation of more than 2,000 jobs over the next decade. A recent study from researchers at the University of Colorado in Boulder, meanwhile, found that a statewide fracking ban would cost the Colorado economy $12 billion and nearly 100,000 jobs by 2040. The national effects of local prohibitions are even more troubling. Among other things, fracking bans lend momentum to a nationwide anti-fracking movement that stands as the chief obstacle to America's domestic-energy revolution. The adoption of new fracking methods across the country is expected to produce well over three million new jobs by 2020, according to a recent report from IHS CERA. By 2025, according to the same report, new drilling techniques will increase the disposable income of the average American household by around $3,500 by lowering energy prices. Since electricity plants are increasingly moving away from coal in favor of natural gas, hydraulic fracturing has also helped the U.S. slash carbon emissions by an astonishing 12% between 2005 and 2012. Plus, thanks almost entirely to fracking, our country is now less dependent on energy resources from volatile regions like the Middle East. In light of fracking's significant benefits, Americans shouldn't be so quick to ban the practice. For citizens concerned about the effects of nearby fracking projects, a more reasonable approach is to collaborate with the industry. In Erie, Colo., for example, Town Administrator A.J. Krieger recently reached a voluntary agreement with two energy companies mandating the use of vapor-recovery units, which capture pollutants that can be vented into the air during the fracking process. My company strives to always deploy such units. Like most others in the industry, we also recycle or reuse 100% of the water we use in fracking operations. Last year, the city council in Loveland, Colo., struck a deal with Anadarko Petroleum Corp. for a new 1,000-foot drilling setback. The accommodation is working well, as evidenced by Loveland voters' recent rejection of a citywide moratorium on fracking. As these examples demonstrate, most oil-and-gas companies—my own included—are sensitive to how their operations affect citizens, and are willing to collaborate with local residents in finding solutions. U.S. energy firms have fracked more than 1.2 million wells since 1947 [over 2.5 million wells have been safely fracked worldwide]. Citizens in places like Denton are right to fight back against fracking operations that compromise their community and way of life. But the actions of a few misbehaving energy companies shouldn't be enough to halt America's energy revolution. Mr. Faulkner is CEO of Breitling Energy Corp. and author of "The Fracking Truth" (Platform Press, 2014) He is also the producer of the coming documentary, "Breaking Free: The Shale Rock Revolution."